For all DEA Registered Practitioners in the State of Oklahoma. This includes Dentists, Nurse Practitioners, Physicians, Physician Assistants, Veterinarians or others who have a DEA registration to Prescribe, Administer, and/or Dispense controlled substances in the State of Oklahoma. The same conference will be held both days. Participants can attend either day. You must register for the conference in advance. The conference begins at 8:00am and ends before 5:00pm with an hour for lunch. Check in is from 7:00am to 8:00am. It is free and attendees will receive a certificate from the Federation of State Medical Boards which they can present to their appropriate boards/associations for possible continuing educational credits. The Federation of State Medical Boards designates this live activity for a maximum of 6.5 AMA PRA Category 1 Credits™. in Patient Care - March 2019. In June of 2018, Oklahoma voters approved medical marijuana through the passage of State Question 788. The law allows qualifying patients to purchase and use medical marijuana from a licensed dispensary if certain criteria are met. Patients must provide a recommendation form signed by a physician. The following provides guidance on physician registration and physician recommendations. 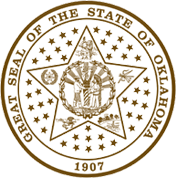 IMPORTANT: The Oklahoma Medical Marijuana Authority (OMMA) Food Safety Standards Board is the authority entrusted to carry out the requirements of this Law. European Union Residents - GDPR Notice: In accordance with the Oklahoma Open Records Act, all applications submitted are a matter of public record. Social Security Numbers and any HIPAA-protected data are redacted. By applying for and retaining an Oklahoma Medical License, you are giving consent to share your information with anyone requesting it and waiving your right to be notified when your data is requested. We are also required to retain licensee records for a minimum of 10 years after the license expires, so any information submitted will remain a public record for that time period. Health Care Providers' Responsibilities and Rights Under Certain Medical Treatment Laws. Information for Patients and Their Families: Click here to read Your Medical Treatment Rights Under Oklahoma Law. To ensure that qualified health care professionals are available to the citizens of Oklahoma. We take pride in our agency's ability to ensure that qualified healthcare professionals are available to the citizens of this state. We will perform our responsibilities with integrity and professionalism. We recognize the importance of personal and professional development for each employee and we will seek ways to expand their knowledge and capabilities. We will be responsive to the needs of the potential licensees. The agency strives to process an application for licensure within a reasonable length time. We are committed to protecting the public from the aberrant practices of any licensed professional. We will be sensitive to the complaints from anyone concerning a professional licensed by the agency. Complaints in any form and from any source will be reviewed, acknowledged and adjudicated to some conclusion within a conservative time period. We will respond in a timely manner to anyone needing services and/or information from the agency in person or by telephone, fax, e-mail, postal mail or the Internet. We value our ability to serve the public by providing useful and easily accessible information. All public records are available for review and all board meetings are open to the public. This website and its contents are updated 3 times daily. Here you will find current and vital information on medical practitioners licensed by the Oklahoma State Board of Medical Licensure and Supervision (OSBMLS). The Board has made every effort to present this information in a timely, unbiased format. Download the MD and Allied Primary Source Verification Contract. Download the Add DO licensee Primary Source Verification Contract. In-depth data available on MDs, Podiatrists, Perfusionists and 9 other Allied Medical Professionals. In-depth data available on DOs (Osteopathic Doctors). Name, Address, Phone, Fax, County of Practice, License Number, Date Issued, Date expires, License type, Specialties, Restrictions, Certifications, Supervisors’ info, Status, Status Class, CME or CE year, Fee History, Hospital Privileges, References, etc. License number, State, Status, Primary Source verified info. School name, Type, Dates From and To, Degree, Verified info. School name, Type, Specialty, Dates From and To, Degree, ACGME and other Verified info. and dates. – All this information is obtained from the Primary Source. Exam type, Date of exam, exam verified info. ECFMG number and date verified, Federation Clearance date, and AMA profile received date – All this information is obtained from the Primary Source. Employer, Specialty, Supervisor, Dates From and To, and verified information. Licensees provide NPI numbers to the Board while updating their profile online – we do not verify this number for accuracy. Date, Action, Reason, Remarks AND Board Orders in PDF format – History and orders date back to 1960s through current. Both these services allow filtering, sorting and drilldown functionalities. License Status changes from Active to Inactive or vice versa. Disciplinary actions such as: suspension, revocation, probation, complaint-citation, etc. Check the status of applicants and know all deficiencies on file and pending dates, etc. real time search count and archive of monthly search counts for billing purposes. Disclaimer to comply with "Primary Source Verification Requirements". Also download the Online Users Contract. 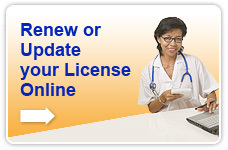 Renew and update your MD, Allied, Perfusionist, or PA license online. Check the status of your application for a new license. Use the VeriDoc Service to send Verification of your medical license (M.D.) and Physician Assistant license (P.A.) to another state medical board. Use the Prescription Monitoring Program to verify patients' prescription drug history before prescribing new drugs.